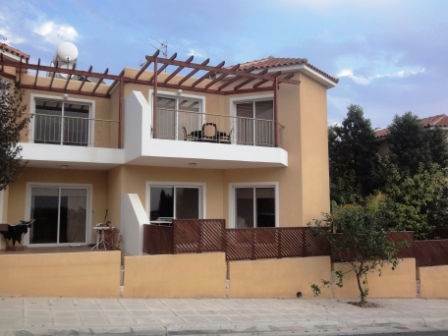 Cyprus Property Blog by Cleo : Lovely Kato Paphos Apartment for Sale - Fully Furnished with Title Deeds- NOW SOLD! • 78 sq. m., 2 bath, 2 bdrm apartment - €129,000 EUR - Title Deeds - Furnished - NOW SOLD! Kato Paphos, Paphos - This spacious 2 bedroom apartment is located in the sought after area of Kato Paphos, a short driving distance from the many shops, restaurants and leisure facilities. Being a project of two storey blocks only, the apartment is on the first and top floor. Entering the apartment there are two archways, the first to the kitchen, and the second to a light and airy open plan living area with patio doors opening onto a large balcony. The kitchen has a breakfast bar to the living room and is well equipped with fridge/freezer, microwave, washing machine, built-in oven, electric hob and extractor fan. An archway in the living area leads to a hallway, off which there are two bedrooms and a large family bathroom. The master bedroom is very spacious with fitted wardrobes, en-suite shower room with double size shower, and patio doors opening onto the balcony. The second bedroom is also a good size with fitted wardrobes and built-in dressing table. The project has a lovely swimming pool area with kidney shaped pool including a wooden bridge and roman steps. Pool showers are located at the side of the pool.